the concerns I had have long since faded away. At the time, though, I wondered how we would find time to care for them. How we would manage the spray schedules. How we would get the soil ready. And how we would manage the trellising on such short notice. 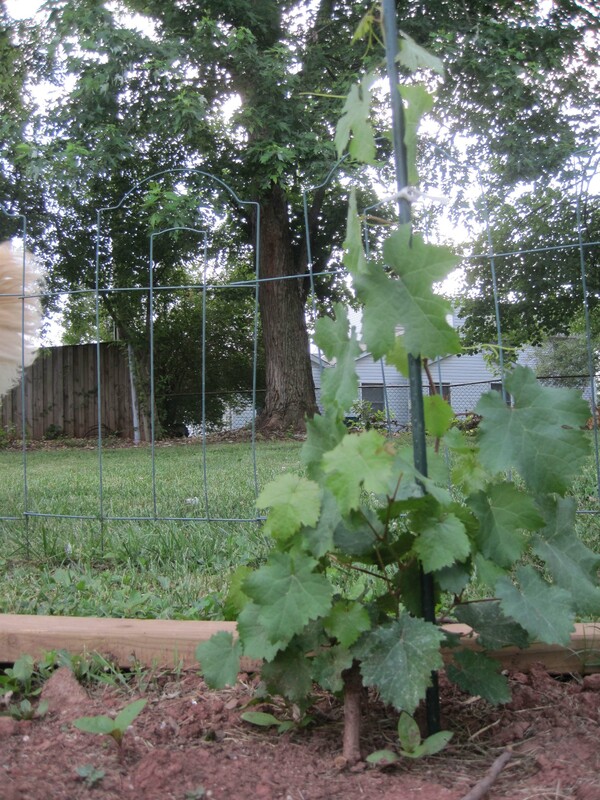 We ended up planting two vines in Nelson County that were given to us after a class on vine grafting, and once we had those in the ground, we realized this was something we could do. So, I took a leap of faith and ordered a dozen Cab Franc vines from Double A Vineyards, figuring that by the time they arrived, we'd find a way to get the ground ready for planting at both the Fairfax and Nelson County sites. More on the Nelson County vineyard later. The first pictures show the state of play in the Fairfax vineyard at the time I ordered the vines. 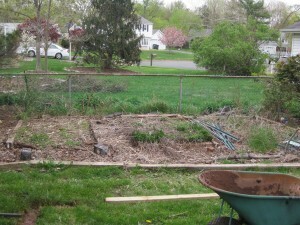 It's part of an old garden, plus a bit of lawn that I decided to appropriate in order to provide room for three separate rows. A closer look at the future Fairfax Vineyard - not a pretty sight, and not much time to prepare. We're not talking big rows: two, with two vines each, and a third with three vines. But it's enough to provide grapes for five gallons of wine, just the right amount to ferment at home. My first problem was finding the time to prepare the vineyard. We were going out of town most weekends (hanging out at the site of the Nelson County family vineyard), and it was getting dark early. 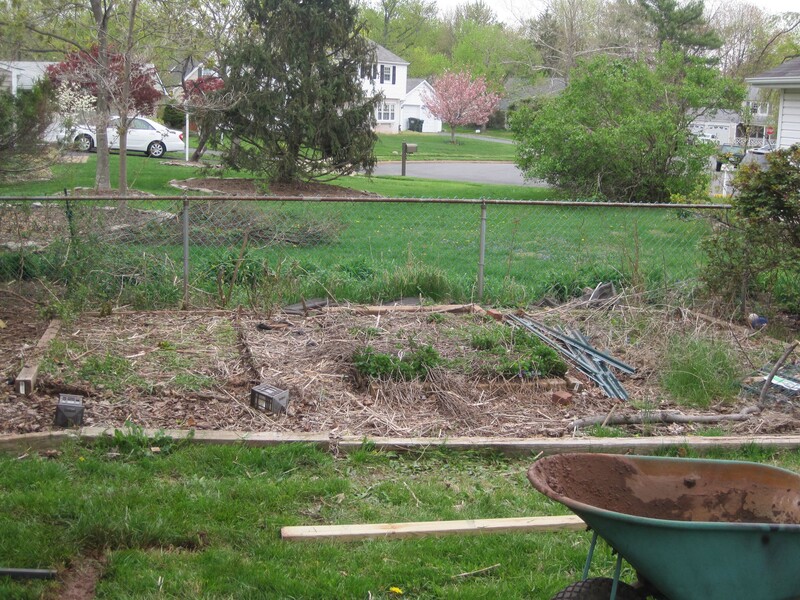 Working when I could, I found time to clear out the growth in the garden, clear the sod in the lawn, and lay out the rows, using eight-foot metal fence posts as a guide. The rows were laid out seven feet apart, and the vines were to be spaced six feet apart. 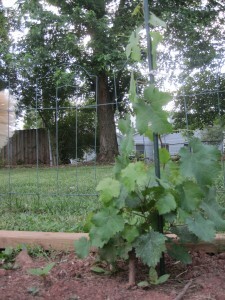 The vines arrived on April 20, and I realized we would not have time to plant in Fairfax that week. Inside the packaging, the roots were wrapped with shredded newsprint that was still soaking wet. It was probably enough moisture, but I added a bit more water anyhow, and resealed the package. Anything worth doing is worth overdoing, in my humble opinion. Overdone or not, the vines stayed healthy, and I planted the following week on April 26. Vines may be a bit too big of a word to describe what we actually planted. 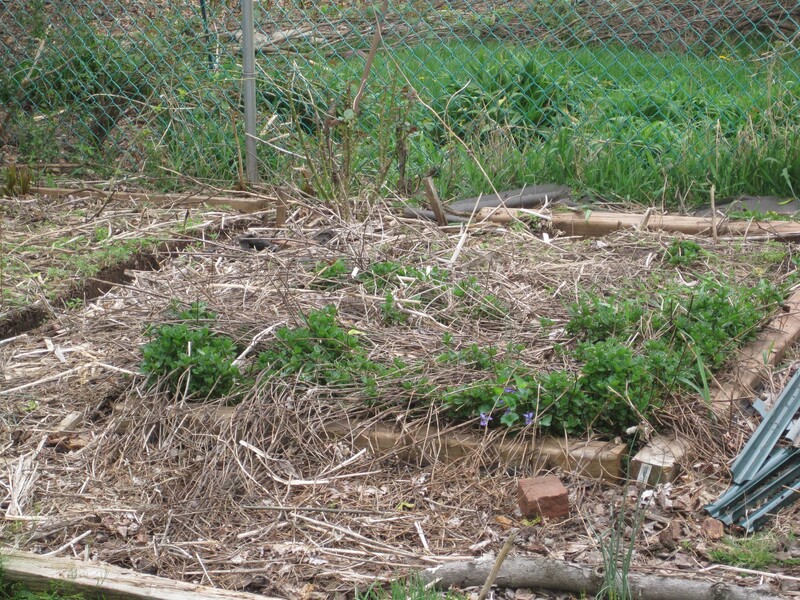 The plants consisted of a healthy-looking root (101-14 for those of you who care about such things – and if you are interested in establishing your own vineyard, you must care about such things), that ended with the graft union. What I was more familiar with was a plant that had both root and a scion, which is the particular type of vine. Cab Franc, for example, comes in a number of different clones and, again, for those of you who care about such things, these were FPS 04/332, grafted onto the 101-14 rootstock. Except that I couldn't see any part of the scion. In other words — and to get back on point — I was accustomed to seeing vines that looked like vines, not roots with a tiny stub of a graft union on top. 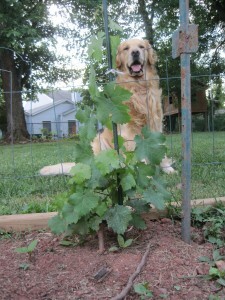 In the foreground, a Cab Franc vine stands 25 inches tall. The one in the background a bit smaller. 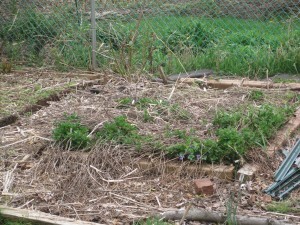 We carefully cleared the hilled-over dirt away, making sure that the graft union was at least two inches above ground. The concern is that if the soil manages to come into contact with the scion above the graft union, the vine itself will begin to develop roots and will essentially be growing on its own root. This is a story for another time, but to make it quick, the vine has everything it needs to grow, including the ability to develop roots, but lacks one thing — resistance to Phylloxera, an insect that that nearly destroyed Europe's vineyards in the 19th century. That's why Vinifera vines (Merlot, Cab, Chard, pretty much every varietal you're accustomed to drinking) must be grafted onto American root stock, which is mostly immune to Phylloxera. We let these vines grow without the grow tubes we used in the Nelson Vineyard. We worried about that decision for a long time (well, weeks) until we decided that grow tubes were creating more problems than they were solving. In any event, these vines are doing pretty well. They seem healthy and vigorous (hopefully not too vigorous), and the tallest of the group is about 25 inches. They need to be pruned back, but that's a story for next time. I've included three pictures, including one with Phoenix the Vineyard Dog standing guard from outside the fence. One footnote: the fence serves to keep Phoenix out, but won't help with rabbits, deer or any of the other Bambi/Thumper-type predators that feed on vines. 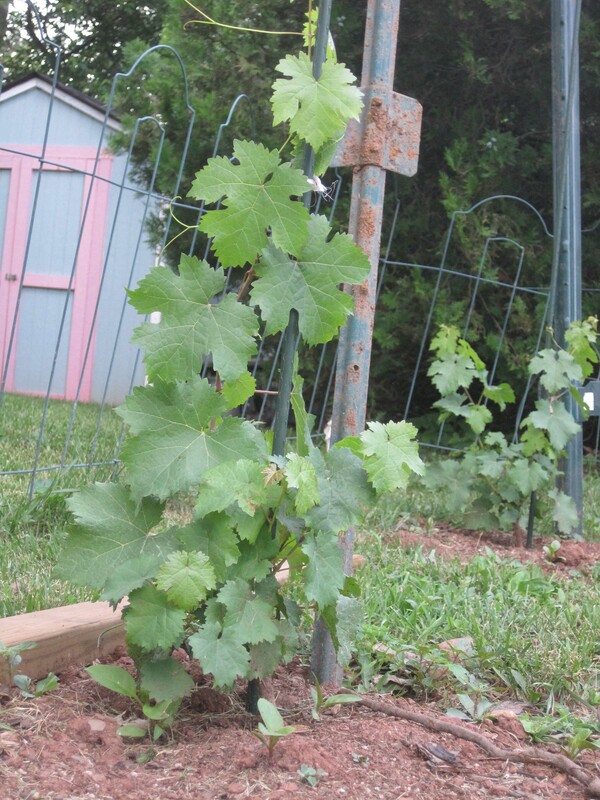 Very soon, we'll be putting up a deer fence, but for now we're counting on luck to keep these young vines safe. « Goodbye to Grow Tubes Forever!